I must admit that I was skeptical. 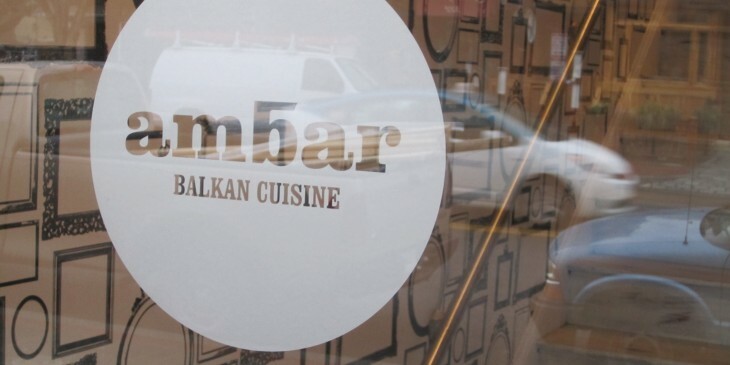 Despite the fact that Ambar, the new Balkan cuisine restaurant occupying the space that was once Jordan’s 8 on Barrack’s Row, is the newest culinary project of Ivan Iricanin, who has made me salivate at Maza 14 and El Centro. This guy is good, I knew, but even a great artist can be limited by his raw materials. And my previous experience with Balkan food gave me pause. In December 2010, I took a last-minute trip to the beautiful country of Croatia with my mother. We traveled to Zagreb, Dubrovnik and Split and were delighted by the people, places and things we encountered, with one significant exception: the food. Croats may have invented cravats, boast gorgeous, ancient cities, produced incredible artists and done many other exceptional things, but the culinary culture there left my spoiled Washington palate with something to be desired… namely, flavor and variety. So, I approached Ambar with some reservation. My two friends who had lived in Bulgaria, however, could not contain their enthusiasm. Was it possible I was just on the wrong side of the Balkan kitchen? We started at the bar. The set up is the same as Jordan’s, with some welcome improvements in color and lighting. The outdoor bar will undoubtedly be a destination after the winter. After discussing the differences between plum brandy and hazelnut liquor with the nice people at the bar, I indulged in the Belgrade, a delightfully sour cocktail with plum brandy, ginger beer and lime. The signature cocktails are named for the capitals of the countries in the Balkans. So far, so good. Soon, our meal began with crispy bacon wrapped-plums stuffed with cheese, hearty sourdough and corn breads and a warm stuffed pepper. Our kind waiter indulged all our questions and you would have never known that it was only the second night a new restaurant was open. You could tell an experienced hand was running the show. The food continued to offer all the flavor and variety I could ask for and missed in beautiful Hrvaška. Crisp salads with colorful peppers and feta, a ricotta cheese pastry, veal-stuffed cabbage, parmesan- encrusted sirloin cooked exactly right, walnut-encrusted chicken that was moist and flavorful, delightfully salty potatoes, and salmon served with an enticing sweet eggplant purée. Everything we ordered (and it was a lot) was delicious and well-presented. I paired my steak with a red Macedonian wine that nicely rounded out the meal. I will be back to Ambar, and I will never underestimate Ivan Iricanin again. Sounds wonderful! Look forward to going there soon.